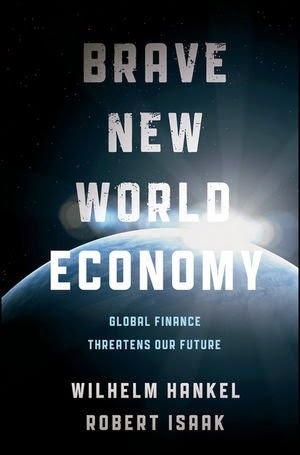 An engaging look at the road to a sustained economic recovery The global finance system can be regulated to prevent massive credit fraud, tame capitalism, confront the sovereign debt crisis, and move towards investing in the real economy and full employment. "Obamanomics", and American reinvention can lead to a sustained economic recovery but only together with major domestic, European, and global monetary reforms in cooperation with emerging nations. For decades, the U.S. dollar has served as the world's reserve currency. But after the global market meltdown and the resulting massive stimulus spending meant to keep the Great Recession from becoming an even Greater Depression, confidence in America's ability to make good on its growing debt is at all-time lows. In Brave New World Economy: Global Finance Threatens Our Future , Wilhelm Hankel and Robert Isaak-two extremely controversial, yet highly respected experts on international economics and management-describe how "Obamanomics," the Euro crisis, and shift of economic growth from the West to emerging economies, if handled properly, can lead to true economic stability and job creation. Highlights America's 'Great Bluff' bail-out strategy to cope with the crisis and the reforms Obamanomics must make to bring about sustainable job recovery Describes the risks and rewards of borrowing from future generations-in the United States, Europe, and the developing world-to save the current generation Details how money became separated from government control and why the interbanking credit system threatens western nations with bankruptcy, undermining pensions, and the human right to work Points out why nation-states need to go back to helping themselves and not rely on the false promises of regional integration and globalization Shows how legalizing underground labor will create more jobs How we arrived at this economic crossroads isn't as important as the decision as to which path to take. The Brave New World Economy points us in the right direction.